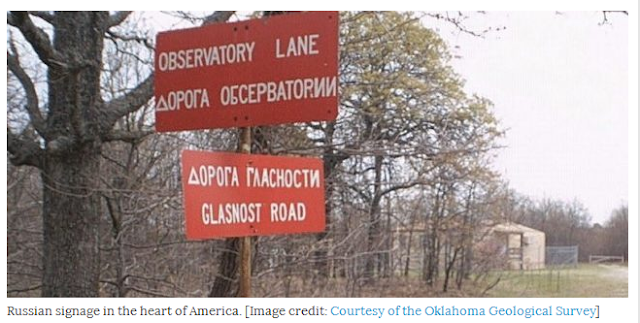 In 1990, a group of Soviet scientists moved to Leonard, Oklahoma. They came as watchdogs, to ensure that the United States obeyed the nuclear Threshold Test Ban Treaty and did not secretly explode atomic bombs below ground. The Soviets needed a profoundly quiet place to observe vibrations in the region, because tremors might confuse their measurements. And in the United States, there were few places as seismically tranquil as Oklahoma. Just over 25 years later, on Sept. 3, 2016, Oklahoma experienced its strongest earthquake on record — a magnitude 5.8. This was followed by a 5.0 temblor on Nov. 6, which rattled Cushing, Oklahoma and prompted the city to close its schools. These days, noticeable quakes of 3.0 magnitude or higher on the Richter scale happen regularly in the Sooner State. In 2015, Oklahomans experienced 890 of these earthquakes. “It’s really a remarkable phenomenon,” says Jeremy Boak, director of the Oklahoma Geological Survey. But despite what you may have heard, fracking is not to blame — though it’s not exactly guiltless, either. What is fracking, and why isn’t it causing Oklahoma’s seismic surge? Since then, the technology has improved, and today it is in heavy use: As of Oct. 2016, there were 112,839 hydraulically fractured oil wells registered in the United States. The U.S. economy has benefited from this “fracking revolution,” which produced 725,000 jobs during the Great Recession of 2007-2009. The technique involves injecting millions of gallons of fluid, composed mostly of water and sand, into a deeply drilled hole. The smallest part of this mixture is the most controversial: one to two percent are chemicals that have the potential to contaminate drinking water. This fluid is forced into the earth, breaking apart rock to unleash bounties of oil and gas. “Some rock formations trap oil so well that they won’t pump out if you just put a hole in them, so you have to break the rock in the vicinity of your drilled hole,” says Boak. Once fracking fluid has cracked apart underground rock, it does not stay in the earth. It’s pumped back to the surface so it doesn’t become a permanent, accumulating pressure in the faults — cracked zones that lie deep underground in the Earth’s crust. Another process sets these faults moving, and that’s causing today’s tremors. After a well is drilled — regardless of whether it was fracked — the liquid contents of the deep earth are pumped up. Some of this is oil, but most of the fluid is water. “It’s the water that’s been inside these rocks for millions and millions of years,” says William Ellsworth, an earthquake scientist at Stanford University. “You can think of it as ancient ocean water, but it’s actually much saltier and it contains natural chemicals, so it’s not economical to try and treat this.” The most economical thing to do with millions of gallons of unusable water is to put it back underground. But the water cannot simply be put back where it came from, because of the flood of earthly liquids being pumped out. So it’s put somewhere new. These places are called disposal wells. Water stays in them permanently. And herein lies the problem. This water builds up over months and years, enhancing and transmitting that pressure deep within the earth, Boak says. Water is heavy. A cubic meter of water, the size of a large washing machine, weighs over a ton. If enough water puts pressure on a fault, it can slip, generating a quake. “Most faults are near a critical stage,” says Boak. “They just need a little nudge to trigger them.” This very thing commonly happens in Oklahoma, some 18,000 feet underground. Not every fault near these massive collections of water will shift and slide. But, Ellsworth explains, there are ancient faults everywhere. And if they are oriented properly, they will slip. So, fracking doesn’t cause any earthquakes? The fracking process can directly cause earthquakes, but they are usually too small to feel, less than 1.0 in magnitude. “It’s not the thing that’s driving the vast majority of the large earthquakes that people are concerned about,” says Ellsworth. Although fracking is practiced throughout Oklahoma — including in Pawnee County where the unprecedented 5.8 magnitude quake occurred — Ellsworth says that in some areas fracking isn’t occurring at all. Here, conventional oil extraction is still bringing up copious amounts of useless water, which must be sequestered back into the earth and can trigger quakes. But wastewater disposal is happening in many places across the United States — Pennsylvania, New York, South Dakota, Texas and beyond. 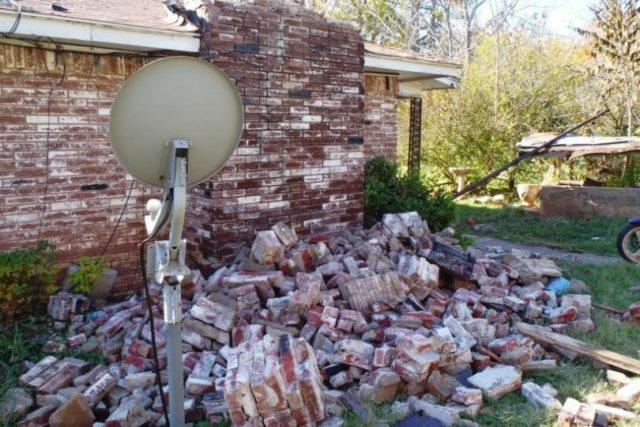 Why is it causing so many earthquakes in Oklahoma? The difference in Oklahoma is the sheer volume of water being pumped back into the ground — in part because of the popularity of fracking. “We did it on a grand scale here in Oklahoma,” says Boak. They had little choice: The fracked formations here produce lots of water compared to oil — sometimes 20 barrels of water for every barrel of oil, explains Boak. This water is put back into a deep rock formation called the Arbuckle group. It accepted massive quantities of water for decades without producing noticeable earthquakes. This changed in 2009, the year that Oklahoma transitioned from a quiet land to one of the most seismically active places in the country, even topping quaky California in 2014. 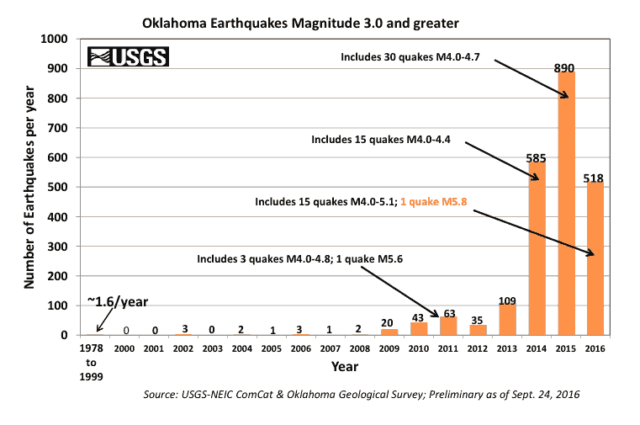 Before 2009, Oklahoma experienced one or two earthquakes of 3.0 magnitude or higher a year. In 2015, they peaked at four and a half a day, according to Boak. The ground had met its limit. By 2013, four million barrels of water a day were pumped into the Arbuckle group. The rock formation became oversaturated with disposed wastewater, pressing the right faults in the right places. Perhaps this will happen in other states too, says Ellsworth. He points to a New Mexican oil field called Dagger Draw, where wastewater injection has resulted in earthquakes. “There are earthquakes occurring there, just not large enough to be widely felt yet,” says Ellsworth. This USGS graph shows Oklahoma’s meteoric rise in tremors. What can be done to stop or slow the earthquakes? In spite of the recent 5.8 record-breaking temblor, earthquakes have slowed. At present, says Boak, the USGS is measuring two and a half noticeable quakes a day. This is probably not an accident: The Oklahoma Corporation Commission, which oversees the state’s oil and gas industry, is trying to reduce earthquake risks. The commission first took action in Sept. 2013, but its efforts were minimal: It closed just one well. But the agency could not ignore 2014’s stirring year of 585 noticeable quakes. Beginning in March 2015, the commission took additional steps. It ordered companies to stop injecting wastewater into certain earthquake-prone places. It also told the industry to inject water into shallower formations, away from deep lying faults. Injections at 500 wells have been cut in half, and some wells have been closed and sealed. “I think that regulators in both Oklahoma and Kansas, where they’re sharing this earthquake problem, have come to the realization that they have to reduce the amount of water that is being injected,” says Ellsworth. Whether this strategy is working, however, is not yet clear. Jefferson Chang, a seismologist for the Oklahoma Geologic Survey, says that the rate of earthquakes is falling in 2016, but the commission’s actions may not be the reason why. The falling price of oil and gas has led to less oil and gas extraction, explains Chang. So there’s less wastewater pumped back into the earth, meaning there’s less water to nudge vulnerable faults. It’s possible that when the price of oil rises and wastewater injection increases, the rate of earthquakes will increase too. But if the commission’s actions work, earthquakes may continue to fall. This will be tested when the industry picks up again, says Chang. If earthquakes have slowed, why the recent great quake? “It takes a while for all of these things to take effect,” explains Ellsworth. “It isn’t like turning off a light switch where things go off immediately. It’s a little bit like turning off the water in the tub and it takes a little while for it to drain.” So while the September quake was big enough to be felt in six states, he wasn’t really surprised it happened. But Ellsworth expects that such large quakes will become less common over the next few years as wastewater is pumped into smarter, shallower places — places less likely to awake a long-slumbering, deep lying fault. By 1997, those Russian scientists packed up their seismic equipment and left Leonard, Oklahoma for good, confident that the United States was not blowing up nuclear weapons in the deep desert. But if they had stayed, the last few years would have been unsettling for the nuclear watchdogs.